This description demonstrates what does masking certain areas of the video image means and how you can use it in different ways. If you mix the masking with a motion detection technology, you can create either a focused security monitoring system or an analyzing system (see later in the Tutorial 9). To implement this functionality, you need to have OZEKI Camera SDK installed, and a reference to OzekiSDK.dll should be added to your Visual Studio project. For Photoshop and Flash users can be familiar the mask therminology. Masking itself means creating a filter that hides or reveals different areas of the image. 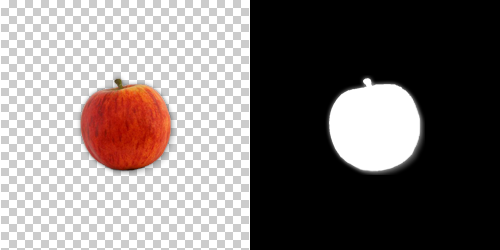 In a nutshell it uses a bitmap, which marks that a pixel of the image is invisible (black) or visible (white) (Figure 1). A mask item can be e.g. a filled shape, a type object or an instance of a graphic symbol. 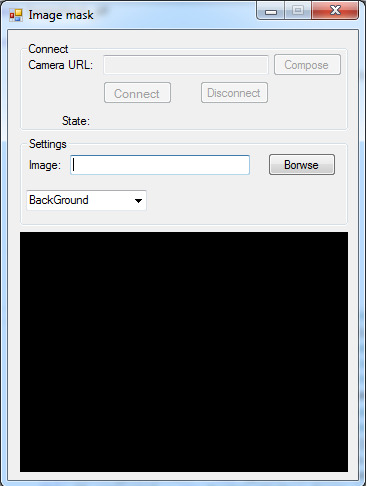 In case of the image of the camera we can limit or lower the range that the user sees. If we combine masking with motion detection we can create a response or counter system with ease. Here are three examples. The first one is for security reasons. There is a museum, which exhibits a 1 million dollar diamond. It has a great and expensive security system, but temporarily it is down with the exception of the remote camera, which sees the hall, the crowd and other displayed pieces. If you add motion detection and a mask, which limits the motion detection to the diamond, then you can create a second alarm system (in case of the first line is down). The second example is for analysis. There is an office and you observe the entrance because you want to know how many people get in (Figure 2) a day. With masking you can reduce the observed area and you can focus onto the entrance hereby turning the motion detector to a counter device. The third example is for privacy reasons. A celling camera of a shop unfortunately observes the fitting room too. With masking you can mask the top of the fitting room without moivng the celling camera to an other position. Why I need to mask instead of zooming? Because some camera doesn't support zooming. If your camera can zoom, but you want to observe the surrounding enviroment too, not just the e.g. certain shelf, than it is advisable to choose the masking solution.